The National Center for Health and Statistics estimates 66 percent of American adults are either overweight or obese, and our jobs are a big reason why. So, what gives? Why do our work environments hamper our efforts to maintain an appropriate weight? About 1/3 of us eat out at least twice during our work week. That means we’re more likely to be tempted by less healthy items offered in excessive amounts. Many of us buy our lunches from vending machines, which typically stock the worst kind of food. 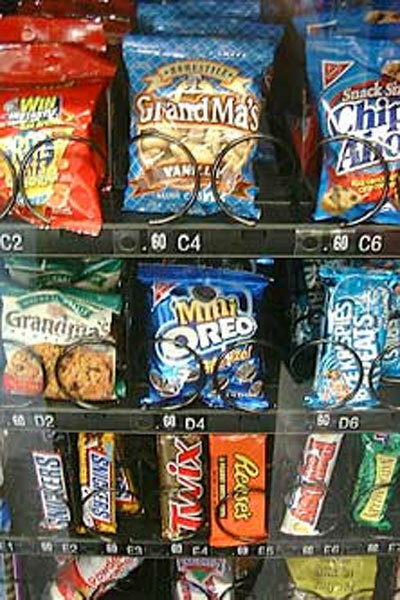 Nearly 2/3 of us buy at least one snack from a vending machine every day. In addition to eating larger quantities of bad food, we don’t usually exercise during the work week, so we’re not burning off those extra calories. Eat a protein-rich, fiber-packed breakfast. Hopefully, that’ll quash the need to raid the vending machine. Drink plenty of water. Thirst is often mistaken for hunger. Keep a food journal. Writing down what you eat makes you mindful of your consumption. Sometimes awareness is all it takes to keep you from downing that next mouthful. Move more. Get up and walk around the office whenever you can appropriately do so. Chill out. When we’re stressed, we often eat to soothe ourselves and calm down. Instead, get more exercise, say a positive affirmation or do some deep breathing. Entry filed under: news around the blogosphere, tips & techniques. Tags: work and weight.